Imja Lake is one of the largest glacial lakes in the Nepal Himalaya and has received a great deal of attention in the last couple decades due to the potential for a glacial lake outburst flood. In response to these concerns, the UNDP has funded a project that is currently lowering the level of the lake by 3 m to reduce the flood hazard. 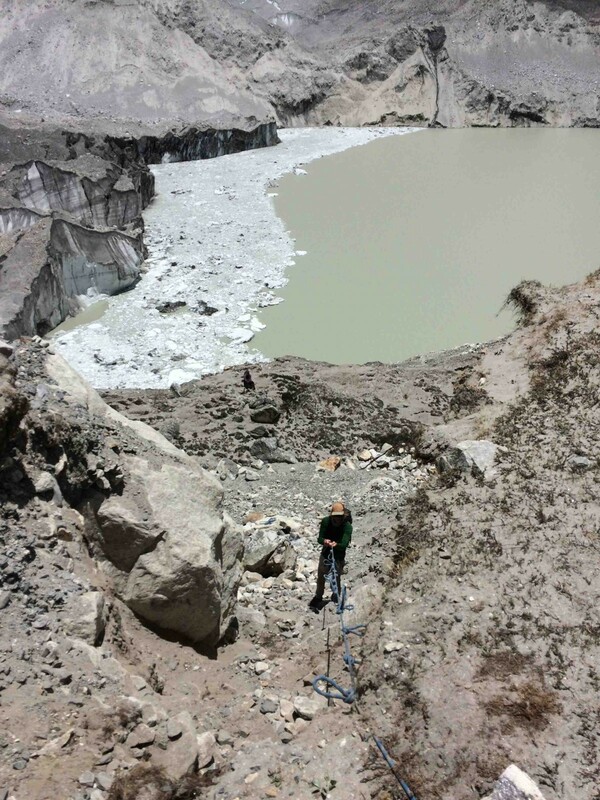 The aim of our research efforts is to understand how quickly the glacier is melting and how rapidly the lake is expanding such that we can model the flood hazard in the future. The focus of this research expedition was to install an automatic weather station, measure the thickness of the ice behind the calving front of Imja Lake, and measure the bathymetry of Imja Lake amongst other smaller tasks. However, before any work could be done, we had to get there first. The launch point for our expedition was Kathmandu, Nepal, where we met with our trekking agency, Himalayan Research Expedition, purchased any last minute supplies, and took a day to kick our jet lag. 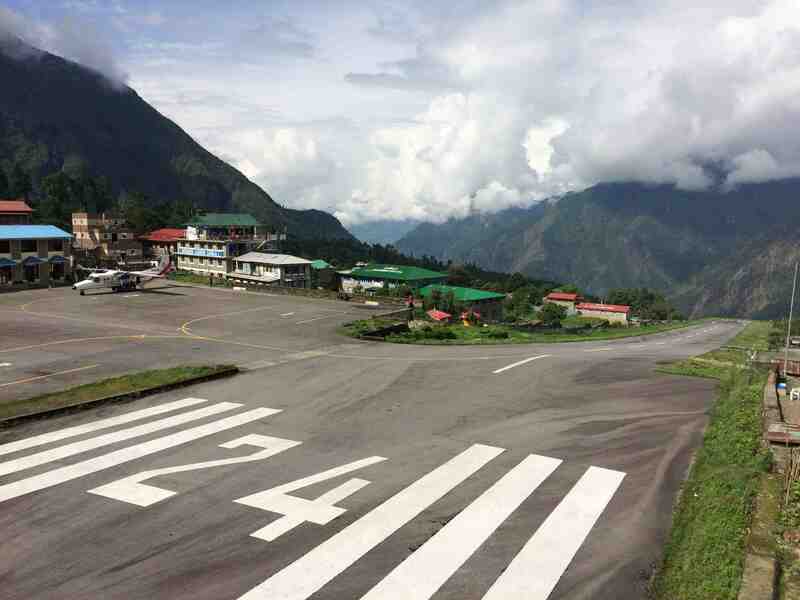 Then the real trip began with a flight from Kathmandu to Lukla. Depending on the weather, this flight can be smooth and showcase the splendor of the Himalaya or it can be nerve-wracking flying through turbulence and clouds. Unfortunately, we had the latter and spent most of the 30-minute class flying through white clouds. Once our feet touched the ground at Tenzing-Hillary Airport, we were all excited and ready to start trekking. Located at 5010 m above sea level (a.s.l) in the Everest region of the Himalaya, Imja Lake required 8 days of trekking to reach our base camp. 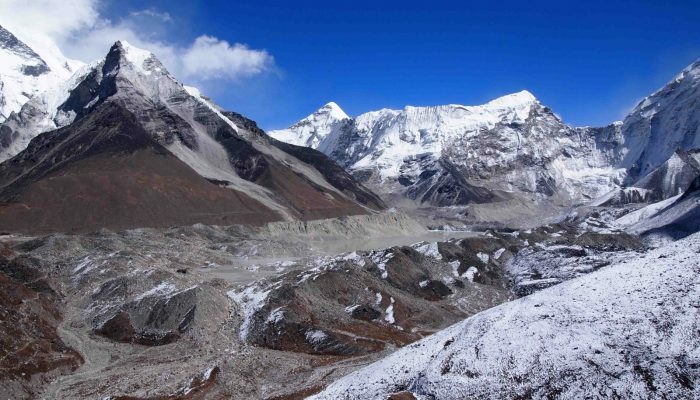 The first 6 days followed the route to Everest Base Camp and provided the first glimpses of Everest, Lhotse, and Ama Dablam among many others. Due to the late start of our trek on May 29th, the monsoon clouds often blocked most of these peaks, so whenever the skies did clear we enjoyed them thoroughly. The 8-day trek also included two rest days (one in Namche and one in Dingboche) that were critical to be properly acclimated. The general rule of thumb that we follow is an acclimatization day for every 1,000 m of elevation gain. After the first rest day at Namche, at 3,400 m.a.s.l., the effects of altitude began to set in. The trekking slowed down as oxygen was a bit harder to come by. By the time we reached Imja Lake, there was about half as much oxygen as there is at sea level. I was beyond excited to be back at Imja Lake. This was my 5th time at the lake and this time I was accompanied by a great team of colleagues. This project is funded by the NSF’s Dynamics of Coupled Natural and Human Systems (CNH) program and is led by Daene McKinney (University of Texas), Alton Byers (University of Colorado Boulder), and Milan Shrestha (Arizona State University). One of the great aspects of this trip was we were all able to be in the field at the same time providing an excellent mix of fieldwork on the glacier and social science work with the communities downstream. 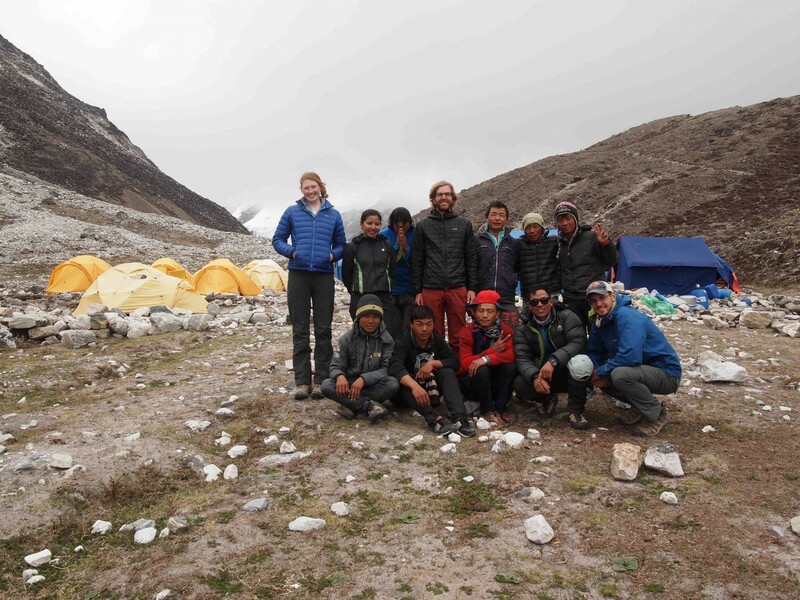 My group consisted of myself, Greta Wells from the University of Texas, Jonathan Burton from Brigham Young University, Alina Karki from Tribhuvan University, and eight hard-working individuals from our trekking agency (unfortunately, Daene was with us, but had to leave the expedition early). The first drastic change that we saw when we got to Imja Lake was the large camp set up by the Army to work on the lake-lowering project. 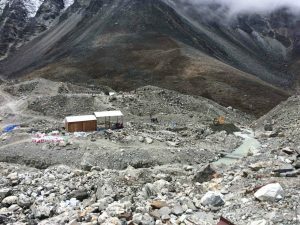 Usually, the only people that we see up here are people at Island Peak base camp, but now the location where were typically set up camp was packed with tents for the workers. The next surprise was seeing a backhoe operating on the terminal moraine (the natural dam comprising sand, rocks, and boulders). Typically, once you get off the plane in Lukla, you don’t see any motorized transportation besides the occasional helicopter flying to Everest Base Camp, so seeing this large piece of construction machinery was quite surprising! The lake lowering project was fascinating to see in progress. A cougher dam has been established to divert the outlet stream such that the typical outlet can be dredged and an outlet gate established, which will reduce the lake level by 3 m. This is a large undertaking due to the difficulty of working at 5,000 m (for both the workers and the machinery), but is an excellent step forward for Nepal in addressing the hazards associated with their glacial lakes. Seeing this large piece of construction machinery [at that altitude] was quite surprising! On June 6th, we woke up at 6:00 a.m. to pure fog and limited visibility – not the weather you hope for on your first day of fieldwork. Fortunately, the fog burned off as the sun came up giving us a nice partly cloudy day to perform our reconnaissance of the glacier for the upcoming work. 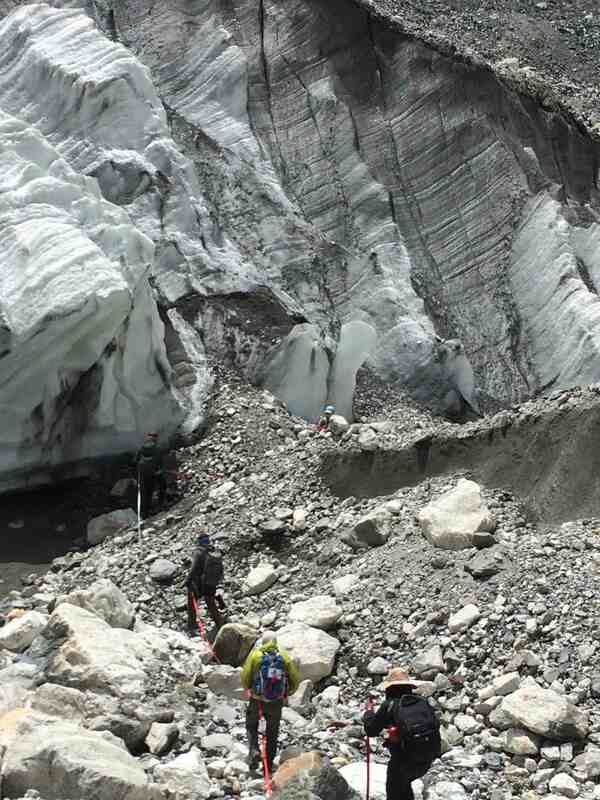 The first task was figuring out how to get onto the glacier from the lateral moraines (the sides of the glacier). This may sound trivial, but the glacier has melted such that the lateral moraines are now over 100 m higher than the debris-covered glacier surface and their slopes are very steep, which makes descending down them quite difficult. Fortunately, we found a good spot near Island Peak base camp, where Laxmi (our guide) set a rope and cleared the path of loose rocks and boulders. Once on the glacier, we were tasked with determining the location of the weather station and wind tower in addition to finding potential routes for our Ground Penetrating Radar transects. 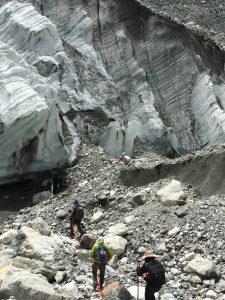 The problem with Imja-Lhotse Shar Glacier is there are very few suitable flat spots. The debris cover on the glacier consists of fine sands, gravel, and boulders with melt ponds and bare ice faces scattered over the surface. The thickness of the debris can range from these bare ice faces to a thin cover of a few centimetres to many meters thick. Needless to say, the heterogeneous terrain can make walking on its surface quite difficult. My initial thought was to use a location where we had installed temperature sensors and ablation stakes two years ago; however, this site had turned into a melt pond ! Hence, we need to select a spot that seems relatively stable such that it won’t be in the middle of a pond when we return! 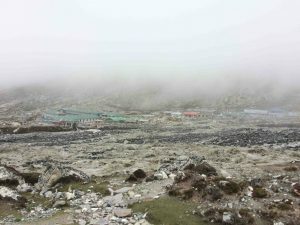 After many hours of trekking on the glacier, we returned to camp fatigued. The altitude wears you down quickly, especially in the first couple of days, so it’s crucial to stay hydrated, warm, and well rested such that we can work hard for all of the 16 scheduled days that we were out here. I find the first couple days to be the most difficult as my body adjusts to the limited supply of oxygen and for the first 2-3 days I typically have a mild headache in the afternoon. A good meal of dal baht (rice, lentil soup, and typically a meat or vegetable curry) along with a good night’s sleep and a little ibuprofen does the trick to have me feeling refreshed the next day though. The first task was to set up the weather station and wind tower. The weather station will record meteorological data every 30 minutes that is important for energy balance modelling. 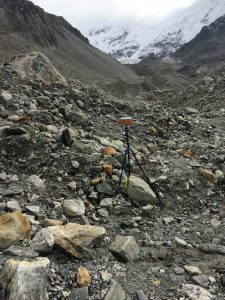 This will allow us to model melt rates that can be applied to the entire glacier such that we can understand the evolution of the debris-covered glacier – crucial for future hazard modelling! The wind tower allows us to measure the surface roughness of the topography, which influences the turbulent heat flux transfers, i.e., the transfer of heat and moisture between the surface of the debris and the air – an important debris property to measure for energy balance modelling as well. Additionally, beneath the weather station, we installed temperature and relative humidity sensors within the debris such that we can understand how heat is transferred through the debris. Each piece of equipment has an essential role in the energy balance modelling. The other large undertaking in the first week was performing ground penetrating radar (GPR) transects on Imja-Lhotse Shar Glacier. GPR is a geophysical technique that is used to measure and detect objects beneath the surface. In our case, we’ll be trying to measure the ice thickness of the glacier. The quick and dirty of GPR is you have a transmitter and a receiver. The transmitter sends a great deal of energy into the ground, which then reflects off various surface, e.g., we should see a strong reflection at the ice/rock interface, and this reflected signal is then picked up by the receiver. Sounds easy right? Things become a bit more difficult when you get on the debris-covered glacier and everything must be carried or dragged across the surface. This requires a lot of people such that the antennas don’t get stuck on the boulders, requires everyone to be walking at the same speed, and requires that all the electrical connections, batteries, etc. are secure and operating. In a nutshell, it is a great deal of work, but provides an excellent dataset to understand the extent to which glacial lakes may grow in the future. When this ice thickness is paired with lake expansion rates, one can predict the evolution of the glacial lake, which is critical for understanding the future hazard associated with Imja Lake. Two full days were spent climbing over the glacier, around bare ice faces and melt ponds, and attempting to collect transects that provide a good picture of the ice thickness behind the calving front of Imja Lake. During these days, we completed half of our planned transects and were ready for our first day of rest. After 6 days of hard work, I was exhausted. The plan was to hike down to Chukung at 4700 m.a.s.l., where we would stay for two nights. A change in 300 m may not sound like a lot, but at altitude, this can provide a great boost in energy. 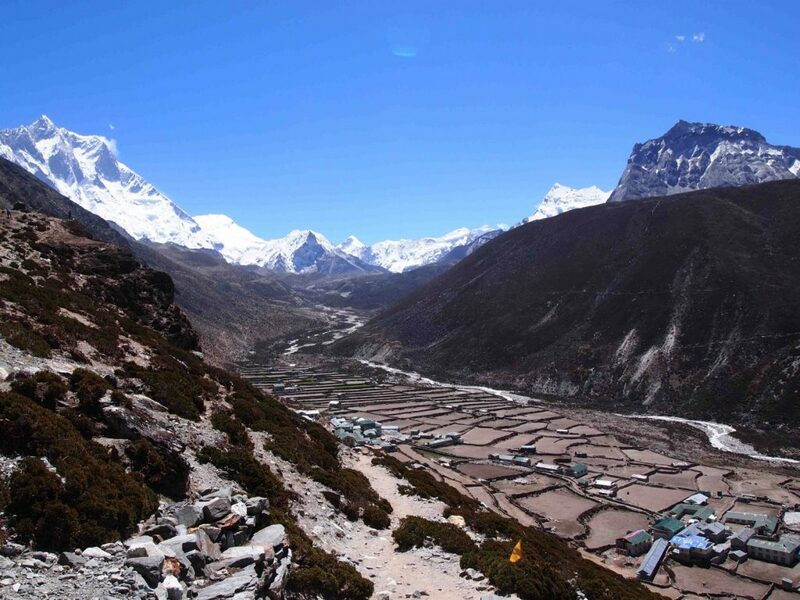 During our “rest day” in Chukung, we were planning to hike down to Dingboche (4400 m.a.s.l.) to help out with a focus group session with the community led by Milan. What happened next was completely unexpected… we witnessed a glacier flood! We witnessed a glacier flood! 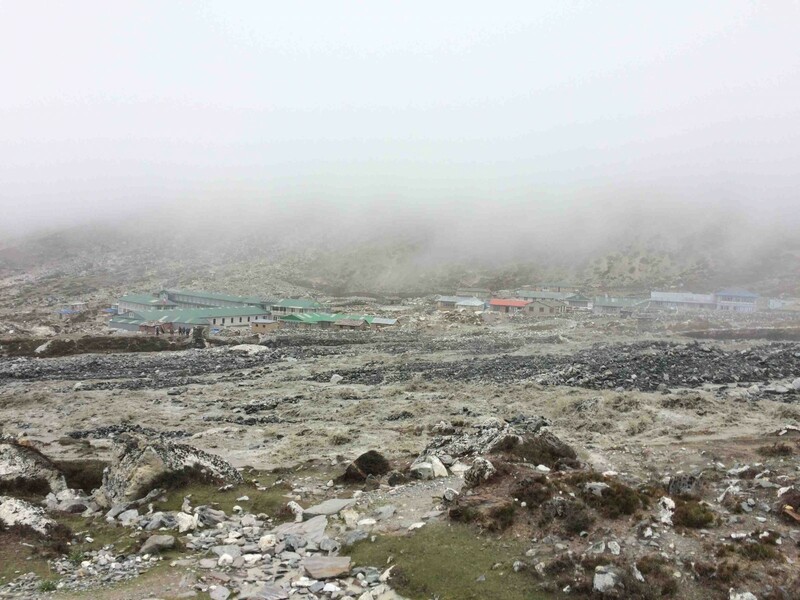 Our colleagues Alton and Elizabeth Byers were heading down to Dingboche before us. Along the way, they heard the sound of a landslide and when they checked to see what it was they were surprised to witness the start of a glacier flood. 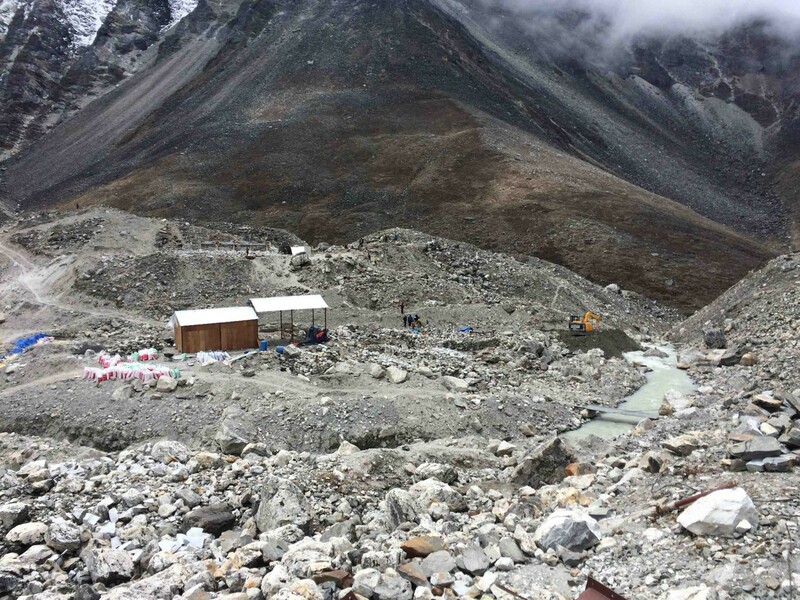 These floods appeared to have originated from the drainage of supraglacial lakes on Lhotse Glacier and appeared to have discharged through a series of englacial conduits. This englacial conduit flood grew rapidly as the initial flood continued to melt the surrounding ice. The videos that Elizabeth took were absolutely remarkable and fortunately everyone in Chukung was safe. By the time we arrived at the typical crossing point around 3:00 p.m., the flood had supposedly diminished by quite a bit, but was still very powerful. We ended up having to an hour detour over an ice bridge (literally a place on the glacier where the flood had carved into the ice and was going underneath the glacier such that we could walk above the flood on the debris-covered surface). It was truly fascinating to witness a flood from a glacier. When we arrived at Chukung, we made the decision to continue hiking to Dingboche such that we were safely out of the potential flooded area. The energy in Dingboche was electric. Our entire NSF group was in the lodge and eager to talk to one another. The flood had also sparked a great deal of interest with community members as they witnessed the flood coming downstream and were fortunately able to contact members in Chukung to learn that this was not a larger glacial lake outburst flood (GLOF) from Imja Lake, which alleviated a great deal of concern. After a good meal and great conversation, we were all exhausted and went to bed early (not to mention that for the first time in over a week we were able to reconnect and update family and friends on the internet, which was a wonderful treat as well). The next day we were able to sit in on Milan’s focus group session with the members of Dingboche. From my background in engineering, I was fascinated to see first-hand the important work that Milan was conducting with the community. The community member’s interest and questions were very inspiring. For many years, these communities have seen researchers come to Imja Lake and not share any of their results. This has led to a great deal of skepticism and also led to unnecessary fear and/or panic, so every opportunity that we have to share our results and have a dialogue with the community is crucial. It is wonderful to be working with Milan as his work is a wonderful vessel for us to learn about the community’s concerns and vice versa, for us to share our work with them as well. I’m incredibly excited to see how this work progresses and see the field science and the social science come together. After a day of “rest” in Dingboche, our team was ready to get back to work at Imja Lake. The first task was more GPR transects on the glacier. The benefit was that we were all feeling rejuvenated from our days at lower elevations and now that this was our 3rd day of GPR things were running smoothly. The other benefit was that after almost 10 days at 5000 m.a.s.l. our bodies were feeling well adjusted to the limited supply of oxygen. The headaches that came and went over the first couple days were non-existent. The only downfall was we were now getting into the heart of the monsoon season, where clouds came up the valley every morning and it rained almost every afternoon. The work had to go on though, so we simply shifted our wake-up time an hour earlier in an attempt to avoid the rain. As our days were winding down, it was time to start splitting up the group. 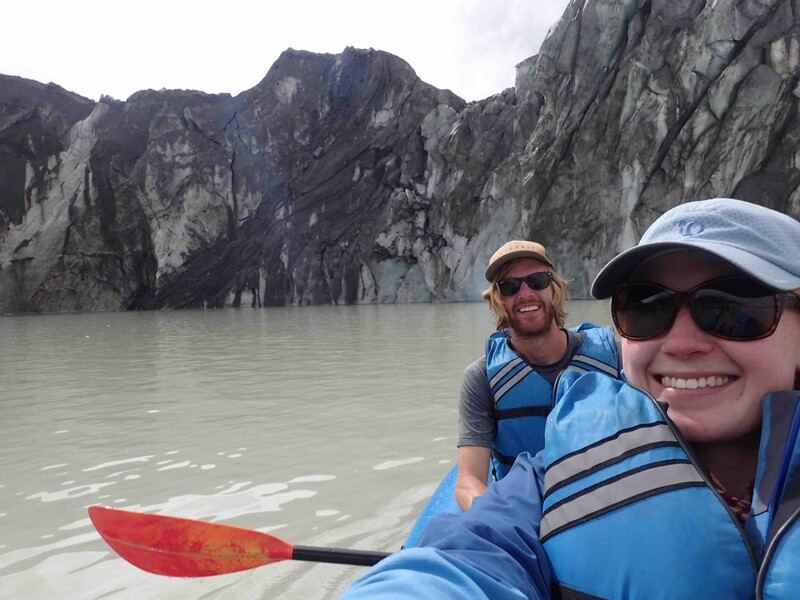 Jonathan and Greta became our kayaking experts and quickly became adept at working the sonar system to conduct a bathymetric survey of Imja Lake. 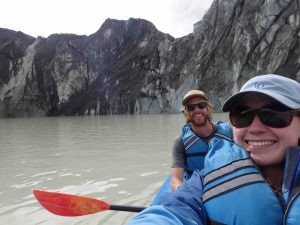 The bathymetric survey is a remarkable experience and one that Jonathan and Greta seemed to thoroughly enjoy. The calving front of Imja Lake is ~10-20 m tall, which seems huge from the view of a kayak on the water. Furthermore, the calving front is quite active each year, so there are icebergs floating on the surface that provide some fun obstacles during the survey. They did a wonderful job and I am incredibly thankful for their support. While the bathymetric survey was being conducted, Alina and I worked on the Structure from Motion (SfM) survey and the operation of the differential GPS (dGPS). Structure from Motion is a technique that allows us to take hundreds of pictures of the debris-covered surface and transform these pictures into a digital elevation model using the software PhotoScan Pro. This technique requires ground control points, which is where the dGPS comes into play. 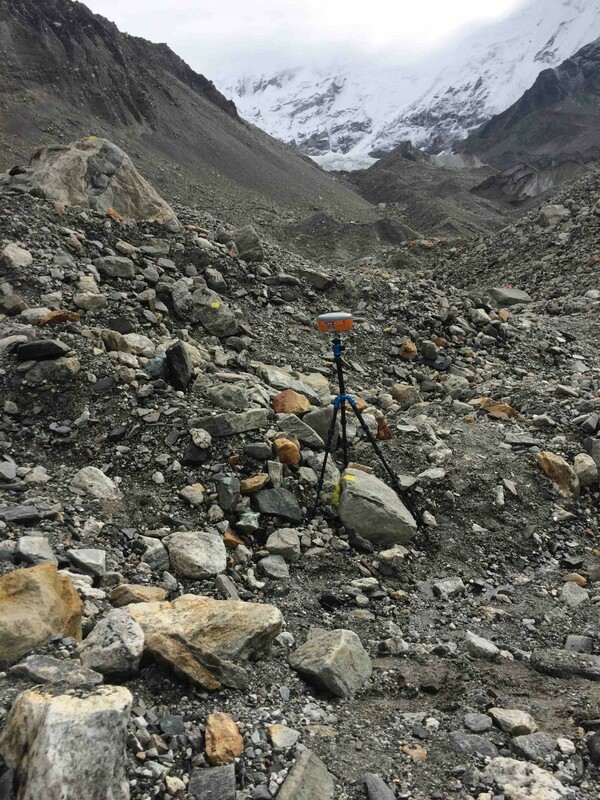 The differential GPS provides centimetric accuracy of specific points on the glacier (in our case spray painted boulders), which provide the spatial scale for the digital elevation model. We had ~40 ground control points and each point took approximately 10 minutes to measure… hence, the dGPS survey was a great deal of work. Once again, I have to thank my wonderful colleague, Alina, for her hardwork operating the dGPS with me. The bathymetric survey, SfM, dGPS, and GPR transects occupied all of our remaining time on the glacier. 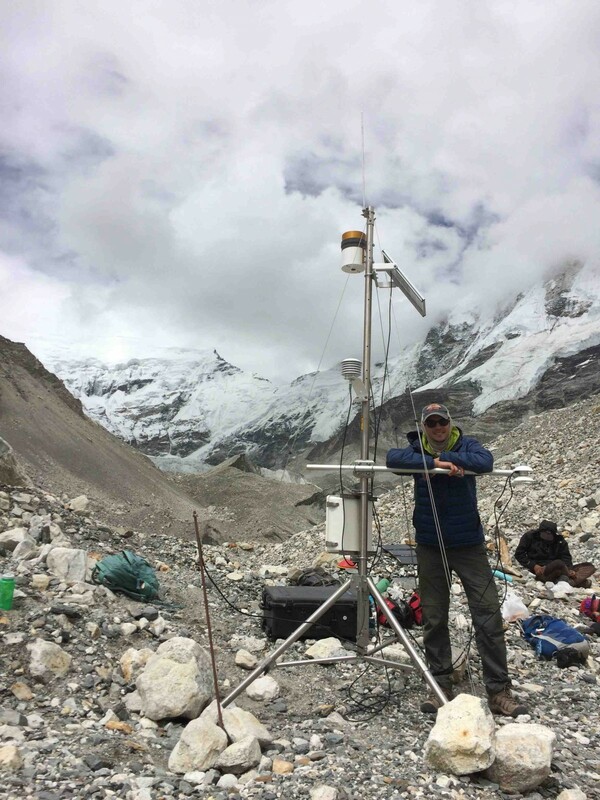 Two days before I left the glacier, I sent our team members off to visit Everest Base Camp and Kala Patthar as the only activities left were finishing off the dGPS survey and downloading the last bit of meteorological data from the weather station. The trek to Everest Base Camp takes about 2 days from our site and I was glad that they would have an opportunity to go visit – they certainly deserved it. Perhaps one of the best surprises of the trip was the day that Jonathan, Greta, and Alina went to Kala Patthar, they had a couple hours of clear skies in the morning such that they were able to see Everest! What a better way to end the trip for them. On my side, the last couple days went very smoothly and I was ecstatic with all the work that we had accomplished. 16 days of hard work paid off and I am anxiously waiting for us to return and collect all the remaining data next year! A special thanks to the NSF-CNH program for funding this research. Also a big thanks to my colleagues Daene McKinney, Alton Byers, Elizabeth Byers, Milan Shrestha, Greta Wells, Jonathan Burton, and Alina Karki among the countless others who were with Alton and Milan’s groups. Lastly, this work would not be possible without the tremendous effort and support provided by Himalayan Research Expedition and our team of guides, porters, and cooks. David Rounce is a post-doctoral fellow at the University of Texas at Austin. Originally from Connecticut, he has spent the last 6 years in Austin, where he received his M.S. and PhD. His research integrates remote sensing, computational modeling, and fieldwork to understand debris-covered glacier melt and the flood hazard associated with potentially dangerous glacial lakes. His research has taken him to the Nepal Himalaya on five separate occasions. For more information on his personal and academic interests, visit David's website. Pingback: Cryospheric Sciences | Image of the Week – Yes, you’re looking at one of Peru’s most dangerous glacial lakes!